Traditionally, the Sendera Draft was known for its appaloosa patterns. Pinto type markings were thought to hide the beauty of the leopard complex spotting, so Mr. Smith prohibited them. To stay true to his vision, the SDHR has continued the exclusion of these patterns. DNA doesn't listen to diagrams. While some horses show very clearly that they carry a particular pinto gene, others could have minimal expression that's difficult or impossible to see. Some pinto patterns are easy to lose in the white of appaloosa patterning. Some patterns look very similar to common face and leg markings. Sometimes random chance produces a horse that looks like a pinto but isn't, thanks to chimerism, a somatic mutation, or atypical expression of a non-pinto gene. Drawing arbitrary lines and stating that white markings cannot cross those lines is unfair to owners and breeders, so the SDHR has chosen to exclude pinto patterns based on genetic testing, not appearance. Effective January 1, 2013, horses believed to carry undesireable white patterns in their ancestry or who appear to express one of those patterns will be asked to complete the white pattern genetic testing. Horses already registered with the SDHR are encouraged - but not required - to get tested if their owners suspect they may carry a particular white pattern. Approved Cross horses asked to test for a white pattern gene who test positive for that gene will not be approved for breeding. Horses applying for regular registration who are asked to test and test positive for the suspected white pattern gene will be granted Showing Only papers. Horses registered with the SDHR prior to the white pattern testing policy are not required to test. If these horses do choose to test, then their papers will be marked with any genes they test positive for, but they will retain the Sendera Draft papers they held before testing. The foals of these horses will be required to complete white pattern testing when registering with the SDHR. Genetic testing is an evolving field, and mutations such as Dominant White are still being discovered. Additional genes may be added to the list of prohibited white patterns, now and in the future. It is the goal of the SDHR to implement such additional testing in a fashion that punishes neither the horses nor the owners, while at the same time removing unwanted genetics from the breed. Tobiano is a vertical pattern: the white tends to drape across the horse's spine between the withers and dock of the tail, stretching down towards the ground. The spots are rounded or oval-shaped, with crisp, clean edges. Legs are often white from the hocks and knees down, and the head and neck are dark. Frame overo is one of the toughest of the pinto patterns to spot on a horse. In the stereotypical presentation, it produces jagged, crisp-edged markings that stretch horizontally along the horse's body. This white does not extend over the back, and may appear to be framed by color - hence the name. It also produces extensive white on the face, typically with jagged edges. In the absence of other leg markings, one or more of the legs will be dark. One or both eyes may be blue. In minimal expression, frame overo can be almost invisible - a single broken or jagged marking might be the only sign. In horses with additional white patterns, the horse might be so loudly marked that the frame is impossible to spot. Sabino type 1 (SB1) can be difficult to spot: the markings it produces can be easily mistaken for other genes, and excessive white can hide it. A horse with one copy of SB1 typically has two or more white feet or legs, a blaze, and spots on the belly or flanks. The edges of sabino markings are typically jagged and may have patches of roan-like coloring around the markings. Additional patches of roaning, separate from the white markings, may appear. A horse that has two copies of the SB1 gene will typically be born white or almost white. There are many types of genes currently called "sabino," some of which are common in Clydesdales, Shires, and other draft breeds. Many of these have not yet been identified in genetic tests. Sabino type 1 is the only sabino pattern that the SDHR excludes at this time. "Splash White" refers to a group of white patterns that produce horses who look like they've been dipped in white paint: high white on the legs, white faces, white bellies, and a white tip on the tail. This white has crisp edges and can extend up over the back in some extreme cases. Some individuals may be deaf. 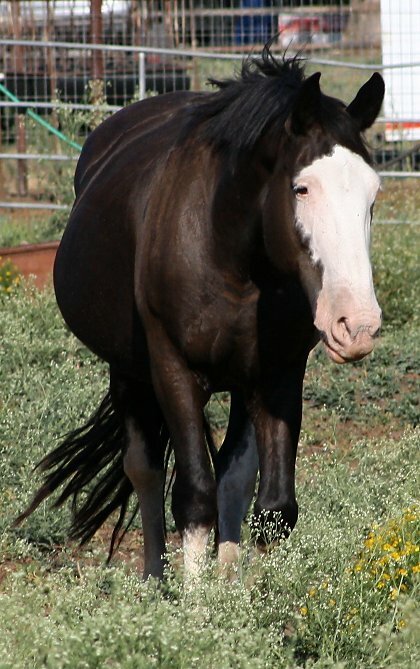 Splash white 2 and 3 (SW2 and SW3) are found primarily in horses with Quarter Horse ancestry. Having two copies of SW2 or SW3 may be lethal to foals, but research is ongoing. There are at least five identified versions of splash white, although only three have tests available to the public, and research is ongoing. Splash white 1 is very common, and can be found in breeds ranging from the Shetland Pony to the Trakehner. Splash white 4 was identified in a single horse who did not produce offspring. Splash white 5 is present in some Appaloosas. Splash white types 2 and 3 are the only splash white patterns that the SDHR excludes at this time. "Dominant white" refers to a group of white patterns that range from minimal, sabino-like patterns to completely white horses. While some of these patterns are found only in a few animals, some are wide-spread across a bloodline or breed. W20 has been located in a wide variety of breeds, including Appaloosa, Clydesdale, Franches-Montagne, German Riding Pony, German Warmbloody, Gypsy Horse, Marwari, Morgan, Noriker, Old Tori, Oldenburg, Quarter Horse, Paint Horse, Peruvian Paso, South German Draft, Thoroughbred, and Welsh Pony. While the other dominant white variations tend to produce markings ranging from sabino-type markings to pure white animals, W20 produces face and leg markings and the occasional belly spot. At least 21 Dominant White variations have been announced to the public, and research is ongoing. Only W3, W5, and W10 are available for public testing; other variants may only be available for testing as part of a study. The SDHR currently excludes W3, W5, and W10, but may exclude additional variants of Dominant White when tests become available.